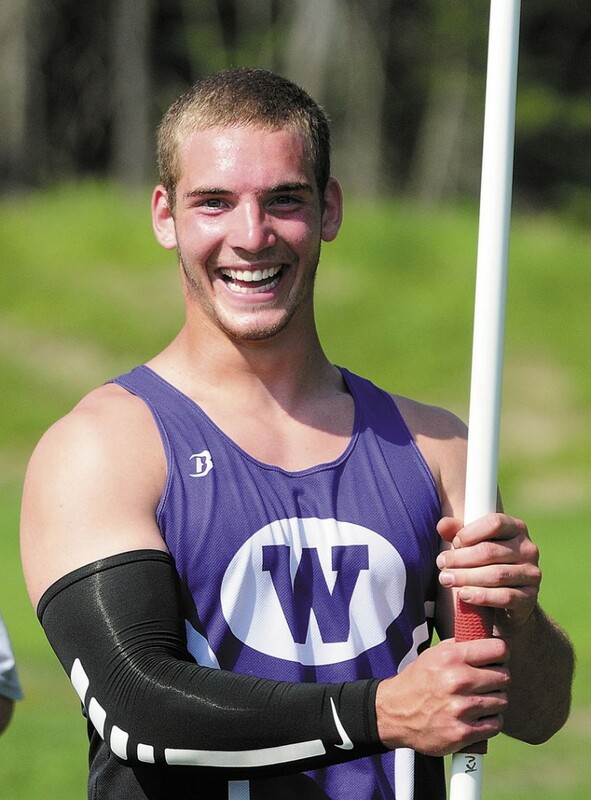 In the spring of his eighth-grade year at Waterville Junior High, Nick Danner joined some track and field teammates for a javelin practice on an open field. Danner recalled how he heaved the javelin and nearly struck a stranger who was walking across the field. Four years later, Danner graduated as one of the top throwers in the state. He set the Class B state record in the javelin with a throw of 192 feet, 10 inches. He also won the shot put and helped the Purple Panthers win the Class B state championship. For his accomplishments this spring, Danner is the Morning Sentinel Boys Track and Field Athlete of the Year. Waterville teammate Jordhan Levine was also considered. It’s been an interesting journey for Danner. When Danner first came to Wilson and the Waterville track team, he threw the javelin but also competed in the sprints and hurdles. It wasn’t until his sophomore and junior years, when Danner bulked up for his role on the football team, that it was decided to become primarily a thrower. He won the javelin at the Class B state meet in his junior year with a throw of 177-7. He was seventh in discus. He certainly was this season. Danner swept the throwing events at the Kennebec Valley Athletic Conference Class B meet at McMann Field. He then crushed the Class B state record in the javelin at the state meet a week later — eclipsing the old mark of 179-1 by more than 13 feet. He won the shot put with a throw of 47-4.5. He would’ve won the discus but he misfired on a few throws after nearly missing the event because of the 4×100 relay. Danner will attend the University of Rhode Island, where he will compete on the track and field team.